This past Saturday, September 15, marked the second anniversary of the creation of the Northeast Canyons and Seamounts Marine National Monument—the largest monument in U.S. Atlantic waters. * From ancient deep-water corals to an incredibly diverse array of marine mammals, seabirds, and fish, the monument is home to an extraordinary abundance of rare marine life. Unfortunately, even being 150 miles offshore has not spared the monument from the Trump administration’s anti-environment agenda. 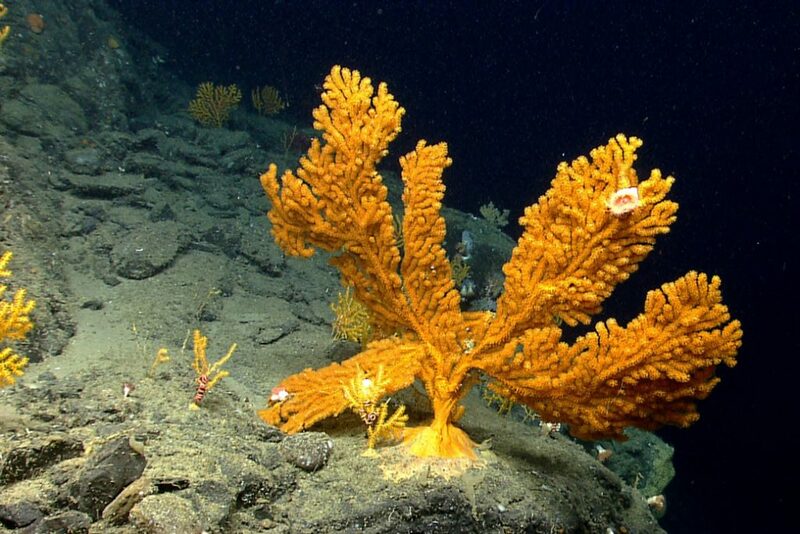 The alleged reason that the Trump administration is targeting Northeast Canyons and Seamounts is to reduce what it calls the “seafood trade deficit.” In order to push the administration’s policy, both President Donald Trump’s secretary of commerce, Wilbur Ross, and acting administrator of the National Oceanic and Atmospheric Administration, Timothy Gallaudet, have made comments alluding to, or directly calling for, opening the monument to commercial fishing. Essentially, their disingenuous reasoning is that opening up this relatively tiny monument to commercial fishing would increase domestic catch and seafood exports to other countries, thereby decreasing the seafood trade deficit. The administration’s rationale, however, is transparently and categorically false. First, allowing commercial fishing in the monument would not lead to an increase in domestic catch, since the monument has not, in fact, reduced domestic catch. Northeast Canyons and Seamounts was one of the historically least-fished areas of the U.S. exclusive economic zone. More importantly, the establishment of the monument does not affect the total amount of fish allowed to be harvested each season by fishermen because monument designations do not alter catch quotas or any other fishery regulation outside of their boundaries; boats are still able to find their total catch elsewhere in the region. A recent analysis by the Natural Resources Defense Council found that, since the monument’s designation, there have been no harmful impacts to major fisheries near the monument, and the catch of a few species, such as butterfish and squid, have actually increased. In fact, there is strong scientific evidence that no-take zones, such as the Northeast Canyons and Seamounts monument, actually increase fisheries productivity. Similarly, in the Pacific, the U.S. purse seine fishery easily caught its allowed limit while not fishing in protected waters. Second, the Trump administration is using domestic fisheries as an excuse to open the monuments while simultaneously harming fishermen, their families, and coastal communities. The seafood trade is international and has been for decades, so the president’s trade war with China has cut off a vital source of income for fishermen from Alaska to Maine. Members of Congress on both sides of the aisle have spoken out against President Trump’s ill-advised plan. Sen. Dan Sullivan (R-AK) asked the administration in a public hearing to remove tariffs affecting more than $900 million in American seafood, and Rep. Seth Moulton (D-MA) introduced a bill that would provide emergency funding to fishermen affected by tariffs. There are very real problems facing American fishermen, fishing communities, and seafood consumers. Climate change is disrupting fishing communities; harmful algal blooms are killing marine life and closing fisheries; and some of the most popular seafoods cannot be eaten by children and pregnant women because they are so contaminated with toxic mercury from coal-fired power plants. Yet opening America’s few and precious marine monuments to commercial fishing will not solve these problems. If the Trump administration is truly interested in preserving American fishing interests, it should consider the consequences of a trade war—especially on the particularly vulnerable industries including fisherman. It should support strong, science-based fisheries management to ensure sustainable harvesting and end overfishing. Furthermore, the administration should expand marine-protected areas to protect habitat and improve fisheries’ resiliency. The Northeast Canyons and Seamounts monument is just two years old, with vast and largely unrealized potential to protect biodiversity and improve local fisheries. Sacrificing it for an empty talking point would be the height of short-sighted foolishness. Alexandra Carter is a research associate for Ocean Policy at the Center for American Progress, and Miriam Goldstein is the director of Ocean Policy at the Center. *Correction, September 17, 2018: This column has been corrected to clarify the number of monuments in the U.S. Atlantic.